Note : This article has been written in March 2013, since Couchbase and its drivers have a changed a lot. I am not working with/for Couchbase anymore, with no time to update the code. A friend of mine wants to build a simple system to capture ideas, and votes. Even if you can find many online services to do that, I think it is a good opportunity to show how easy it is to develop new application using a Couchbase and Node.js. Note: my goal is not to provide a complete application, but to describe the key steps to develop an application. How to Get the Latest Document by Date/time Field? I read this question on Twitter, let me answer the question in this short article. "hiredate":"Jan 1, 2013 8:32:00 AM"
Finally it is important when you work with views to understand how the index are managed by the server so be sure your read the chapter “Index Updates and the stale Parameter”. Create a master and child documents and link them using an attribute. In the first case when all the information are stored in a single document it is quite easy to use the entire set of data and for example create a screen that shows all the information, but what about the second case? In this post I am explaining how it is possible to use Couchbase views to deal with that an make it easy to create master/detail views. As an ex-Oracle employee, I am using the infamous SCOTT schema with the DEPT and EMP tables, as the first example. 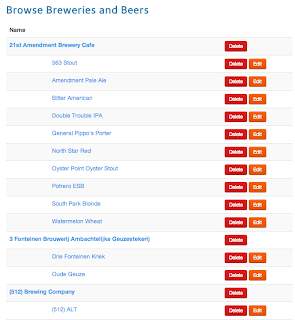 Then at the end I will extend this to the beer sample data provided with Couchbase. Couchbase is a schema-less database, and you can store “anything you want” into it, but for this you need to use JSON documents and create 2 types of document : “department” and “employee”. You can use any pattern to create a key, for example for the employee you could chose to put an email. Note the “dept_id” attribute in the employee document. This is the key of the department; you can see that as the “foreign key”. But remember, the relationship between the department and employee documents are managed entirely by the application, Couchbase Server does not enforce it. 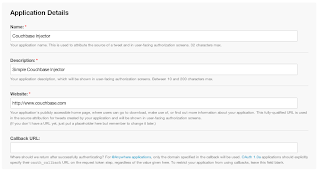 You can learn more about the cbdocloader tool in the documentation. Queries inside Couchbase are based on views; and views build indexes, so we have to create a view, a “collated view” to be exact. This is in fact quite easy to do with Couchbase views. The only trick here is to control the order and be sure the master is always the first one, just before its children. With this view you can now use the result of the view to build report for your application. It is also possible to use parameters in your query to see only a part of the data, for example by departement, using for example startkey=["dept__20",0]&amp;endkey=["dept__20",2] to view only the data -Department and Employees- of the deparment 20-Research. Once you have publish it in production you can use it in the Beer Sample application, for this example I have modified the Java sample application. Create a servlet to handle user request and on the /all URI. 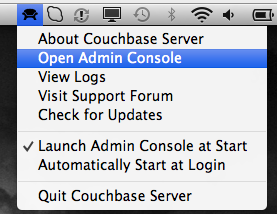 In a previous post I have explained how to use Couchbase and Node.js on OS X. Since it is quite different on Windows here another article about it. These steps are documented in the Couchbase Server Manual. It is quite easy to install Node.js using the Windows installer provided at http://nodejs.org. Node is installed. So far so good ! The -g parameter indicates that this module will be installed globally and added to your %PATH%. GYP uses Python to generate the project, so you need to install it on your environment. I have installed Python 2.7.3 using the Windows installer. Finally you need a C/C++ compiler, the best way to get it is to install Visual Studio. As you probably know I am not a Windows expert and I do not know a lot about Microsoft development tools. I have downloaded Visual Studio Express the free development tools from here; it was sufficient. Couchnode uses libcouchbase the C client library, so before running the npm install for Couchbase, you need to install libcouchbase itself. You can download it from Couchbase site. The Windows versions are located in the left menu of the page. Download the zip file, that matches your environment. I have downloaded the “Windows, 64-bit MSVC 10”. Node-gyp will look for all the dependencies (DLL, library headers) into c:\couchbase directory, so you need to unzip the file in this folder. This location comes from the binding.gyp file of the couchnode project. Install and Test Couchnode itself! We are now ready to install and use couchnode itself. For this we can create a new node project. You have successfully installed couchnode. all this on Windows 7. When you are developing a new applications with Couchbase 2.0, you sometimes need to create view dynamically from your code. For example you may need this when you are installing your application, writing some test, or you can also use that when you are building frameworks, and wants to dynamically create views to query data. This post shows how to do it. The full Maven project is available on Github. The first thing to do when you want to create a view from Java is obviously to connect to the cluster. If you are looking for more information about Couchbase and Java, you can read this article from DZone : Hello World with Couchbase and Java. Let’s now talk about Couchbase views. You use views/map-reduce functions to index and query data from Couchbase Server based on the content of the JSON document you store inside Couchbase. For more information about views you can look at the “view basics” chapter of the Couchbase Server Manual. Creating a view from Java is really easy : the Java Client Library contains all the classes and methods to do it. As a concrete use case we will use the Application that is described in the Couchbase Java Tutorial. Create a design document using the com.couchbase.client.protocol.views.DesignDocument class - line 4. Create a view using com.couchbase.client.protocol.views.ViewDesign class with a name and the map function - line 14. Finally save the document into the cluster using the CouchbaseClient.createDesignDoc method. If you need to use a reduce function (built-in or custom) you just need to pass to the ViewDesign constructor as 3rd parameter. View Writing Best Practice : for example in the map function, I do not emit any value. I only emit a key (the beer name). First of all, the view that you just created is in “development mode”, and by default the Java client SDK will only access the view when it is in “production mode”. This means that when you are calling a view from your application it will search it into the production environment. So before connecting to Couchbase cluster you need to setup the viewmode to development. This code queries the view you just created. This means Couchbase Server will generate an index based on your map function, will query the server for results. In this case, we specifically want to set a limit of 20 results and also get the most current results by setting Stale.FALSE. What to Do if Your Couchbase Server Does Not Start? You have the following error when accessing the console "[10:02:02] IP address seems to have changed. Unable to listen on 'ns_1@10.0.2.15'"
When you try to restart the server it does not start and you have the following error message in the error log : "Configured address '10.0.2.15' seems to be invalid. Will refuse to start for safety reasons"
Some of these issues are related to a known issue on Windows ( see MB-7417 that will be fixed in 2.0.1) or the fact that Couchbase server does not support change of the IP address after installation. This is documented in the section “Using Couchbase in the Cloud: Handling Changes in IP Addresses” of the Couchbase Server Manual. This article explains what should be done when configuring Couchbase Server on Windows, but you can do equivalent steps on any platform using the shell scripts available on Linux and/or Mac OS X. Typically the address 192.168.0.97 is stored in the configuration of Couchbase. If your server receives a new address from the DHCP server, Couchbase will not work anymore. In this article you will see how you can configure Couchbase to use another IP address or Hostname. Important: The steps that follow will completely destroy any data and configuration from the node, so it is best to start with a fresh Couchbase install. If you can not, you should backup your data using the file based backup-restore documented here. Yesterday was my last day at eXo… I have been working at eXo since 2008, and we have achieved many exciting things such as building eXo Platform, the open source social platform, and the Cloud-IDE allowing developers to build, test, and deploy applications online. An easy way to create large dataset when playing/demonstrating Couchbase -or any other NoSQL engine- is to inject Twitter feed into your database. In this example I am using Java to inject Tweets into Couchbase, you can obviously use another langage if you want to. The setUp() method simply reads the twitter4j.properties file from the classpath to build the Couchbase connection string. The injectTweets opens the Couchbase connection -line 76- and calls the TwitterStream API. A Listener is created and will receive all the onStatus(Status status) from Twitter. The most important method is onStatus() that receive the message and save it into Couchbase. The mainClass entry allows you to set which class to execute when running java -jar command. The Class-Path entry allows you to set the current directory as part of the classpath where the program will search for the twitter4j.properties file. This will inject Tweets into your Couchbase Server. Enjoy ! NOTE: The Couchbase Node.js Client Library is currently changing. I will update this article and source code once the API is stable. I am currently playing a little bit with Node.js . It is quite fun! In this article I won’t go in a a very complex application but just give you the basic steps to create your first Node.js+Couchbase application… on Mac OS X.
I will try to post more articles, if I have time to show how to use Couchbase from your applications (starting with Java). I am using Couchbase on Mac OS X, so let me describe the installation in this environment. If you are using other operating system just take a look to the Couchbase documentation. Download the Mac OS X Zip file. Double-click the downloaded Zip installation file to extract the contents. This will create a single file, the Couchbase.app application. Drag and Drop the Couchbase.app to your chosen installation folder, such as the system Applications folder. 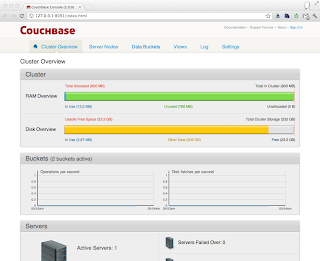 To start Couchbase Server, just double click on the Couchbase Server. Once the server is started, a new icon is added in the OS X Menu to indicate that the Server is up and running. You can now configure your Couchbase instance, for this you just need to access the Admin Console, available at the following location http://127.0.0.1:8091 (change the IP address if needed) or simply by going in the Couchbase menu and click on Open Admin Console entry. Set the disk and cluster configuration. On my instance I keep the default location for the on disk storage. Just configure the size of the memory usage for your instance, for example 800Mb. 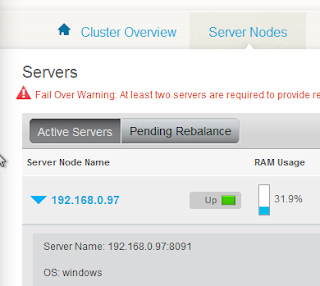 So far, we have a single instance, so no need to join a cluster. Choose to generate sample data. This will be interesting to learn more about data and views. Create the default bucket (use for testing only). A bucket is used by Couchbase to store data. It could be compared to a “database” in RDBMS world. When this is done you are automatically redirected to the Admin Console. This is it! You are ready to use your Couchbase server. Couchbase has many ways to manipulate data from you favorite programming language using the different client libraries : Java, Python, PHP, Ruby, .Net, C. For now let’s use the Admin Console to create and query data. Couchbase can store any type of data, but when you need to manipulate some data with a structure the best way is to use JSON Documents. So let’s use the console and create documents. 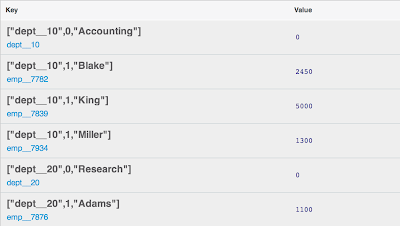 To create new documents in your database, click on the “Data Buckets” tab. If you have installed the sample you see 2 buckets: default and gamesim-sample. Since each document must have an id for example 100. You have now a list of employees in your database. That was easy isn’t? Let’s now query them. This function takes the document and create a list that contains the “dept” as key and null as value. The value itself is not that important in our case. A simple rule will be : do not put too much data in the value since at the end Couchbase server creates an index with this map. Will see that Couchbase allows developer to easily get the document information when accessing a view. When I get more time I will write another article that do the same from Java, and other languages.